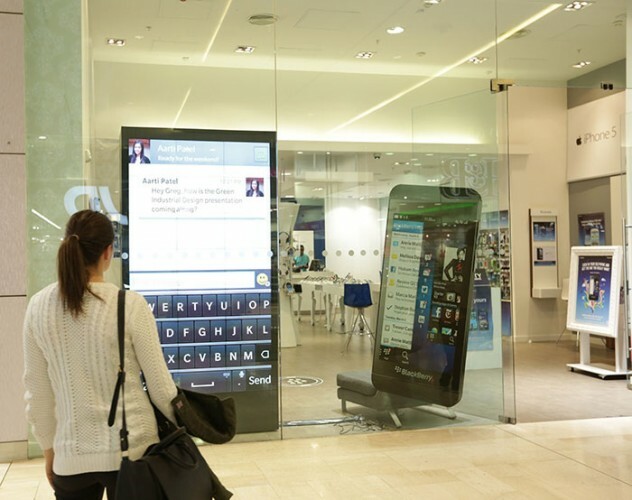 A ‘working’ ten-foot high smartphone created by trade AV specialists PSCo Rental using innovative videowall technology brought BlackBerry the footfall it needed to get the launch of its Z10 device off to a flying start in the O2 stores at two prime UK shopping centres. PSCo Rental provided a turnkey package to trade partner TC Communications Ltd for this project, including recommending and providing the display solution, logistics and technical support. BlackBerry briefed integrated marcom agency TC Communications to deliver a high street marketing campaign that brought visual excitement and engagement for its new Z10 smartphone. According to Jamie Barlow, digital director of TCC: "At shopping centres the key challenge is to attract attention in a busy environment. Our creative vision was to build a giant Z10 in each shop window that copied the user interface of the device exactly, playing content as though someone was using the device. The content highlighted six key features that set the Z10 apart: Camera Time Shift, BBM Video, Browser Speeds, The Hub, Smart Keyboard and BlackBerry World." Commenting on its partnership with PSCo Rental, Jamie Barlow, added: "We briefed PSCo Rental on our creative concept and they came back with a videowall that realised it perfectly. They recommended an innovative technology which provided exactly what we needed, designed a package including display mounts and power connection, installed the display at the store and removed it at the end of the campaign. Everything was taken care of – rigging the wall, 24-hour technical support during the campaign and de-rigging it afterwards. PSCo’s technical recommendation was right on the money too – the quality of the images on the videowall was stellar, and the lack of reflection was particularly striking. BlackBerry was extremely happy both with the videowall and with the outcome of the campaign." Stuart Holmes, CEO of PSCo Group, said: "Constructing a replica ten-foot high mobile phone is one of the more interesting briefs we’ve been involved in – and it is these more challenging projects at which we really excel. Our team has access to one of the widest ranges of large format display technologies in the country – but more importantly fully understands how to install and support them properly. We will come out on site literally at any hour of the day or night to perform the installation, ensuring that we have everything we need to finish quickly. Our package also includes full technical support, with technicians available 24x7 in the unlikely event of a problem." The displays ran continuously for a month, resulting in nearly 400 demos by the specially trained O2 angels at the two stores. The BlackBerry Z10 was constructed from a rear projection tile technology and left a lasting impression on customers and angels alike. One shopper commented, "It’s a really busy shopping centre with lots going on. The display in the window really grabs your attention and makes you want to go inside to find out more." An O2 angel involved in the demonstrations agreed, saying "I’ve done about 35 demos so far and the displays really help the customers ‘get’ the product." PSCo Rental supplied two videowalls of 21 tiles in a 3x7 portrait formation which were set up in the O2 stores in Westfield Stratford and Westfield White City. PSCo staff fitted the walls when the mall closed at 10.30pm in the evening – carrying the equipment some distance across the mall as there is no direct vehicular access to the stores. It took just four hours to build the giant Z10 videowall in each store, and two hours to take it back down again at the end of the promotion.